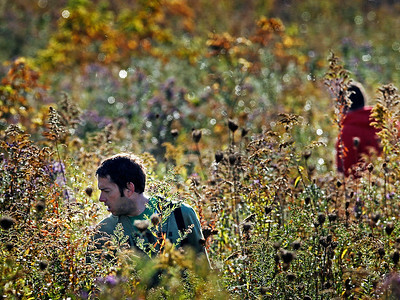 Matthew Apgar - mapgar@shawmedia.com Keith Carey of Lake In The Hills, front, and Robert Soutar of St. Charles, right, look for their discs in a nearby field during in a disc golf tournament on Saturday, Oct. 10, 2015 at Fischer Park in Lake In The Hills. Matthew Apgar - mapgar@shawmedia.com Joe Carey of McHenry lines up his shot on the second hole during a disc golf tournament on Saturday, Oct. 10, 2015 at Fischer Park in Lake In The Hills. 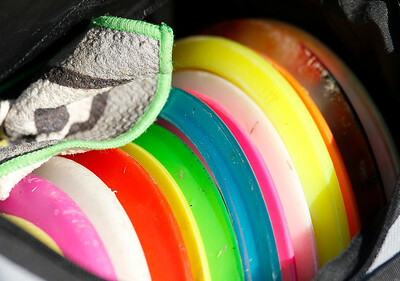 Matthew Apgar - mapgar@shawmedia.com Dave Iverson of Kenosha comes prepared with a variety of discs for use in a disc golf tournament on Saturday, Oct. 10, 2015 at Fischer Park in Lake In The Hills. 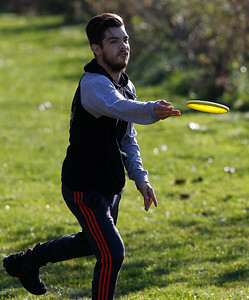 Matthew Apgar - mapgar@shawmedia.com Alex Iverson of Kenosha tosses his disc during a disc golf tournament on Saturday, Oct. 10, 2015 at Fischer Park in Lake In The Hills. Matthew Apgar - mapgar@shawmedia.com Competitors walk to their discs during a disc golf tournament on Saturday, Oct. 10, 2015 at Fischer Park in Lake In The Hills. Competitors walk to their discs during a disc golf tournament on Saturday, Oct. 10, 2015 at Fischer Park in Lake In The Hills.